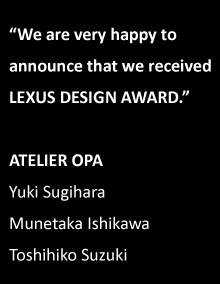 We are happy to announce that we received LEXUS DESIN AWARD. The exhibition will take place at central Milan’s Museo della Permanente art museum from April 10th to 14th, 2013. 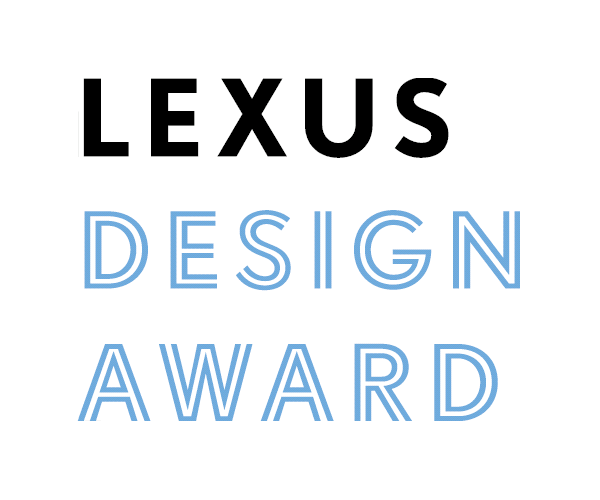 LEXUS DESIN AWARD is an international competition that targets next generation innovators around the world. The theme of the award was “motion.” Applicants must submit 6 images and two movies to provide original perspectives on and solutions to various issues of daily life. From October 30 to December 31 2012, total 1,243 works were submitted from all over the world. From more than 2,100 registrations initially recorded, 1,243 projects were finally received on time, mainly from product Design (50%) and architecture (30%). The remaining 20% are from various fields such as graphic design, interior design, fashion, film & TV. Registrations were recorded from around the world, with 44% coming from Europe, 32% from Asia (incl. Japan and China) and 20% from the USA. We newly developed “The drinking fountain.” It is our new artworks to emphasis the importance of water through unique various patterns. After subission, our works was put into “art direction” category. Now, the result was announced at Lexus Global website. We are very honored to receive LEXUS DESIN AWARD. Twelve winners from nations including Spain, Iran, Taiwan, Jordan, Korea, Japan, Italy, Canada, Israel. 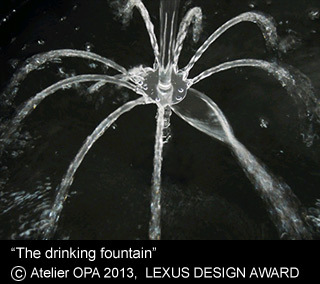 12 winners’ works will be unveiled in the Lexus space at the Milan Design Week in April 2013. I hope that you will stop by our exhibition, admission free. ATELIER OPA / Yuki Sugihara, Munetaka Ishikawa and Toshihiko Suzuki.